I had such high hopes for this match. Well, obviously, I wanted Milan to advance, but even if we didn’t, I just wanted some good football. But I forgot who we were playing and where. I should have known that it wouldn’t have been football that determined this match, but those who play the game in that shadowy moral area of dives and protests, and by a referee who lost sight of his biggest responsibility, to keep control of the game and allow it to be played. Barca 3, Milan 1, Football 0. "Ibra, come on down here and give me some sugar"
To be fair, Barcelona were the better team, and the result is the correct one, even if it was gained questionably. Milan started out disjointed and a little slow to react. Unlike the solid, defensive side that did their best to take advantage of counter attacks last week, our defense and offense were somewhat isolated from one another. This left the defense subject to wave after wave of the Barcelona attack, and left our offense waiting for through balls that never came. Within the first 10 minutes, Messi already had 2 attempts. And in fact, Barcelona would have 21 shots on the night, with 8 of those on goal. Milan, on the other hand only had 3 shots, 1 on goal. At least we were accurate on the one on goal. But it was in the 11th minute that things took a turn away from football. Antonini, last week’s hero, clipped Messi’s foot as he tried to clear the ball in the box. Messi went down, the ref pointed to the spot. Antonini got a yellow card. Messi took the penalty, 1-0 Barcelona. It's not a clean tackle unless you show the ref it is by putting your arms up. Penalties just don’t seem sporting, even if they are meant to make a wrong right. And if we were struggling to find our game before this, now we were also deflated. Play continued, Barcelona attacking, and Milan trying to defend. In the 25th, Abbiati easily managed a shot by Messi, but in the 26th, an attempt by Dani Alves nearly took out Abbiati, although to his credit, he still saved it, of course. Here’s my first rant. There is a rule that is in place to protect keepers when players slide into them studs up like that. Actually, there’s a rule against players sliding into anyone studs up like that, and on an outfield player, I think he might have called it. But this ref made no call, even when it looked like Abbiati might be done for the night. Which sets a bad precedent so early in the match, and left Abbiati hurting and Barcelona having the advantage both psychologically and physically. Shame. But then magic happened. In the 33rd, the ball was in the midfield, Robinho got possession and made a sweet turn in and then passed the ball to Ibra, who then fed it to Nocerino, who ran in and scored. 1-1 all, and suddenly it looked like this might be actual football after all, rather than a referee-aided soap opera. The shots kept coming: Xavi, Messi, Fabregas, and Abbiati was my MotM by default, I think he got the most touches on the ball. But then football lost something again. 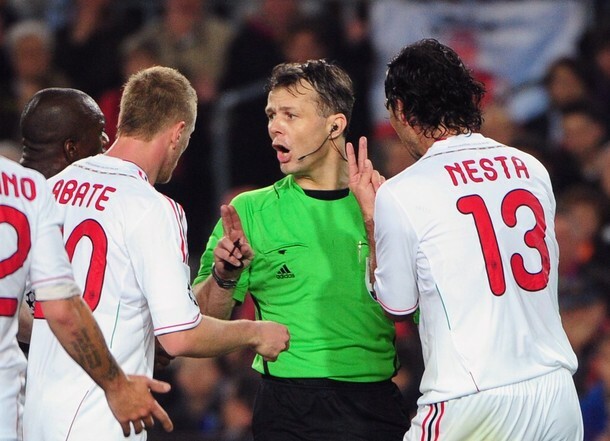 In the 40th, Nesta was awarded a yellow and Barcelona a ridiculous second penalty. Why? Because Nesta was holding onto Busquets’ jersey. Now the rules of the game do say that this can be a penalty in the box, let’s be clear. The ref didn’t necessarily make the wrong call per se, but most refs wouldn’t call it. Particularly when Busquets’ buddy Puyol had full body contact with Nesta and helped push him as Busquets fell to the ground, all too easily as usual. Messi eventually took the penalty and converted it, 2-1 Barcelona. Kuipers: "Let's stand here a little longer and argue about this. My legs are tired." So here’s my second rant. If you’re going to make that call, make it. Be a man. Control the game and set up the PK. But this ref, apparently preferring the drama, allowed talking to go on for nearly 2 minutes, “forcing” him to give another yellow, this time to Seedorf for dissent. And it wasn’t like he was discouraging the talking. He stood there, just letting them all talk, saying barely anything at all. Other refs would be making sure the ball was placed on the spot and clearing the box for the penalty. So now we’ve stopped the game for 2 minutes, gotten the players more riled up, and handed out another yellow card. This, to me was the crime this ref made. Not just here, but throughout the match, he never really had control of it, and Barcelona played it to their advantage. Get a questionable call, let Milan get upset, wait until they earn themselves a yellow, and capitalize on it when play resumes. Like a classic Telenovela, they really should have earned some sort of award for these games. And shame on the ref. Not that you can honestly argue that Milan would have definitely won with a better ref, but the way the game was played, it really was a loss for football. 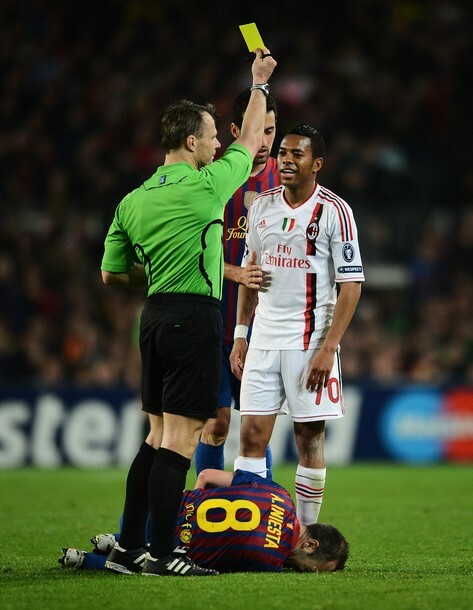 Boateng: "You may be short, but I can still see you." In the 58th, Boateng fouled Messi, and Xavi took the resulting free kick, but it went just wide. Then in 53rd, Iniesta sealed the deal with a real goal, scored on the run of play. This may have been a dagger in the hearts of Milan fans, but it did seem to bring us back to the actual game of football, and I for one, am glad that they scored something other than the penalties. After that, Allegri actually used his subs, and early, for him. He took Seedorf off in the 61st, who was out of gas, and sent on Aquilani, who did supply some fresh legs. In the 70th, he brought on Pato, first game back from injuries, to replace Boateng, who looked just a couple of minutes shy of completely losing his cool. But his third sub was strange. He took Pato off for Maxi Lopez in the 83rd. Pato had been making some great runs forward, and didn’t seem to be in any discomfort. Strange. Gee, Mr. Kuipers, you sure are in a lot of these pictures. The one call I would say the ref got wrong was in the 62nd, Robinho was called for a handball while racing in to score. Pique kicked the ball at him, but replays show it struck his torso, not his arm, and the ref called it a handball. But it wasn’t a guaranteed goal, anyway, Valdes handled the shot he took as the whistle blew. The explosion of yellow cards saw just 2 the entire match for Barcelona, on Mascherano in the 66th and Cuenca in the 86th for shirt pulling. (At least the ref was certain to give a call both ways, even if theirs did not result in a penalty.) 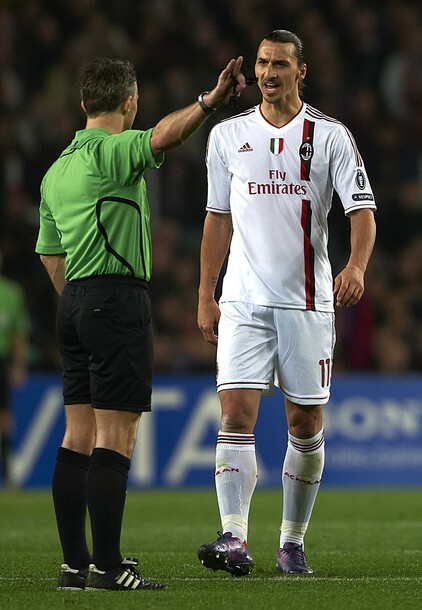 In addition to the 3 cards earned by Milan in the first half, he handed them out like candy at the end of the second. Robinho earned his in the 77th, and then Mexes, Maxi Lopez, and Nocerino all earned theirs in stoppage time. Can you spell frustration? "And YOU get a card. EVERYBODY GETS A CARD!" And so Barcelona proved that, on a decent pitch, they still deserve the title of the Best Team in the World. You can argue that they are diving, cheating, vertically impaired people of questionable character. And perhaps you may be right on some level. But they also played better tonight. Milan went out in a blaze of yellow to the Best Team in the World with our character intact. We weren’t given one, let alone two penalties. We weren’t really given any calls in our favor. We didn’t play our best game, and I think Thiago Silva may have helped us write a different script at the Camp Nou. But in the end, we bow out of the Champions League with our heads held high. Tomorrow will be just midweek, and we will be able to focus our entire efforts on maintaining our lead in the table and winning a second Scudetto in as many years. It’s just too bad that tonight, football was the real victim. A game of this magnitude could have been so much better if it were managed better. But it could have been better if we had played better, too, and until we are taking 21 shots in a Quarterfinal match instead of 3, then the result is fair. When we can learn to control our destiny despite any drama, then we will be worth of moving on to the Champions League Semifinals. Perhaps next season?